Deep red color in the glass. Rich, complex fruity and Cabernet-specific herbal notes that are completed by a round, soft landing on the palate. This Cabernet was so spectacular that we felt it deserved to be showcased in its own bottling to demonstrate its varietal strength. This single varietal was fermented as four separate Cabernet clones whose fermentations occurred in one ton lots that were guided to achieve the most varietal intensity possible. From the moment the grapes hit the crusher, they were nurtured and encouraged to excel. 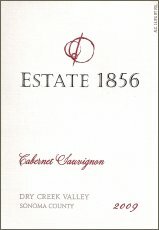 Each clone, (4,7, 191 and 337), exhibited a different aromatic and flavor profile that was eventually blended together to provide a complete example of the Cabernet varietal. After fermentation, the wines were individually pressed into a selection of new and used barrels so as to harmonize the varietal attributes and add a bit of barrel ageing to balance the flavors. This 2009 Cabernet Sauvignon was barrel aged for 22 months in French oak and is composed of 96% Cabernet, 2% Petit Verdot and 2% Merlot. FOOD PAIRING NOTES: This Cabernet would best complement a main course of succulent red meat, surrounded by a rich, fruity sauce and balanced by a potato side dish. We’d suggest a Herb Roasted Pork Loin.